In 1882 John Jacob Astor and his brother William commissioned architect Thomas Stent to improve the property at 575-579 Broadway with an impressive brick-and-stone commercial structure where the family offices had stood. Stent was the Astor architect of choice and a year later he was called upon to product a store-and-loft structure immediately across the street at Nos. 560-566. Working in the same materials—brick, stone and cast iron—Stent produced a handsome six-story building in what has been called the “Commercial Palace Style.” Like the similar W.& J. Sloane Building designed by William Wheeler Smith just a few blocks north and completed two years earlier, Stent’s structure was sturdy and robust. The stone courses that interrupted the brick piers and the carved cornices above the first, second and fourth floors relieved the otherwise bulky mass. Foliate-carved capitals and leafy cast iron pilasters between the windows, as well as the handsome crowning cornice and parapet, gave visual interest. Stent lavished attention to small details, like the subtly-different carved pilaster capitals. While still relatively high-end, the Broadway neighborhood had, by now, begun filling with the dry goods and millinery trade. In 1893 Francisco Bianchi, listed as a “clubman,” ran his artificial flowers shop from here. Later in the decade S. Stroock & Co., dealers in “felt” was here. 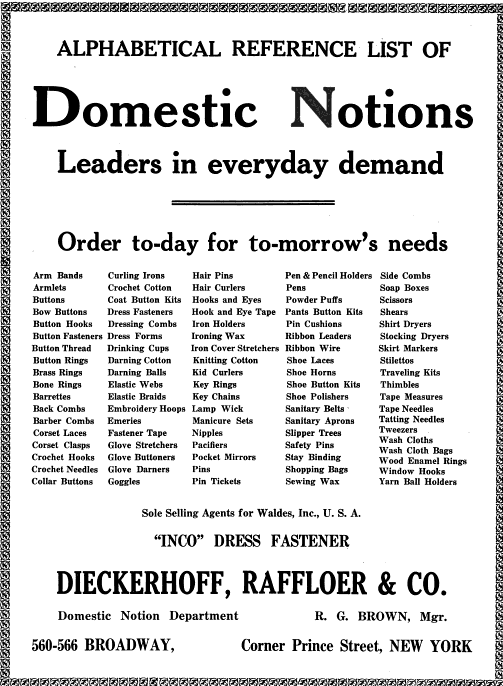 In May 1907 Astor leased 70,000 square feet to the highly-regarded importers of German “notions and fancy goods,” Dieckerhoff, Raffloer & Company. At the time Acme Leather Goods Company leased the entire third floor. Acme was required to move to the fourth floor a year later when Dieckerhoff, which had also been doing business from its previous address at No. 364 Broadway, leased the entire building. The German-owned firm announced plans to occupy the first three floors of the building. The company would continue to flourish at Nos. 560-566 Broadway for nine years before trouble came. In the meantime apparel, millinery and related firms continued to fill the upper floors. In 1910 Edwards & Rierdan Co., commission and banking firm was here. The bankers specialized in the business of “wholesale dry goods and millinery trade.” And in 1912 Robert Reis & Co., manufacturers of men’s underwear, operated from the building. A Siegel-Cooper advertisement in The Evening World that year noted that “Everybody knows Reis Underwear. Most good haberdashery stores stock it.” Under their business clothing Edwardian gentlemen wore Reis madras knee drawers or combination suits. Although Woodrow Wilson tried valiantly to keep the United States out of the European conflict that would become known as The Great War, the country was pulled into the war in April 1917. As American boys left to fight in France and Germany, anti-German sentiment rose and tensions mounted. A year later, on June 25, 1918, The New York Tribune reported that A. Mitchell Palmer, the Federal Government’s Alien Property Custodian, had taken over Dieckerhoff, Raffloer & Company. Palmer accused the firm of a plot “to conceal valuable enemy properties” under the guise of an American corporation. Also under the shadow of suspicion were owners Rudolph Erbsloh and William H. Erhart. Ernest Raffloer was living temporarily in Cuba when the take-over occurred. 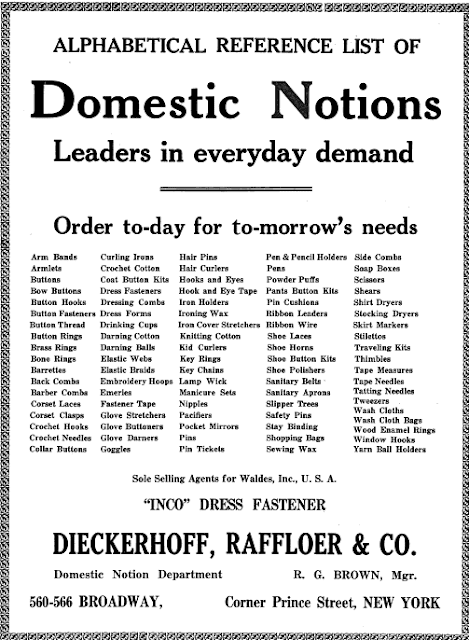 In 1918 the Report of All Proceedings Under the Trading with the Enemy Act called the firm’s actions “an instance of the deliberate concealment of enemy property through a pretended sale engineered by American counsel.” By the end of the year Dickerhoff, Raffloer & Co., the largest distributor of notions in the country was “being liquidated and will no longer be the chief distributing agent of the cheap, German manufactured novelties,” said the Report. The same year Palmer had taken over the American Storage Company, also in the building, owned by Paul Mecke, Leo Heppe, Wunnersche Bitumen and the estate of Von der Heide, all of Unna, Germany. Although the Broadway and Prince Street neighborhood suffered a period of neglect in the mid-20th century, it rebounded as galleries and artists’ lofts later revitalized the SoHo district. Before long the Staley-Wise Gallery and the Peter Freeman, Inc. gallery would join him. The handsome building that Thomas Stent designed for John Jacob Astor in 1883 is superbly preserved. Dean & DeLuca continues to purvey produce and gourmet foods here and the upper floors where artificial flowers and men’s underwear were made now exhibit contemporary art.